With a slight coolness to the air (FINALLY!) around here, it's starting to feel a little like fall.... in late October! Makes me want to go out on my porch and roast a marshmallow in the fire. Seriously, that's one of the first things I think of when the change of seasons arrives here in the South. It's always the sugar, always. 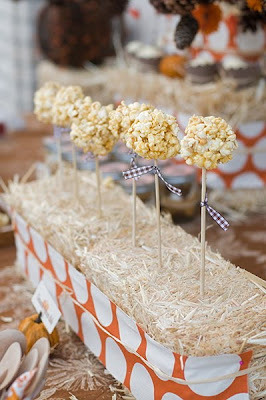 Fall brings so many wonderful things, including some great fall tablescapes seen around the web. 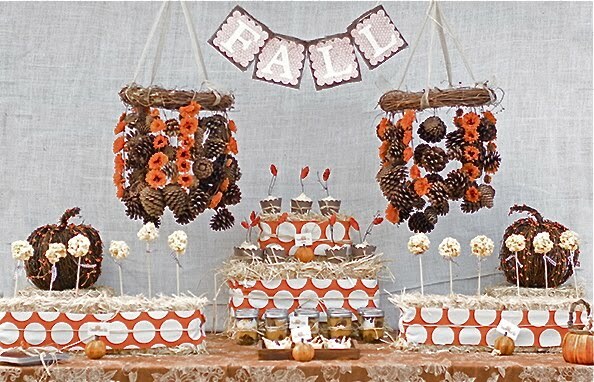 I love the rustic feel to fall tables.... apples and pinecones, branches, browns and oranges. 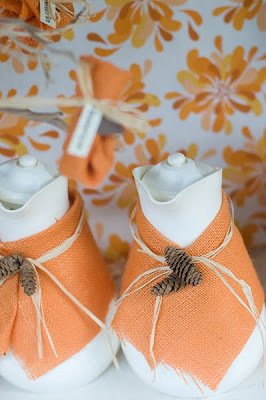 There are so many great ones out there, but today I wanted to show you one of my favorites from Katie Grace Designs . Katie has an amazing ability to take the ordinary and make it extraordinary. Look at these wonderful pictures -- I think she's brilliant. Isn't it fabulous?? 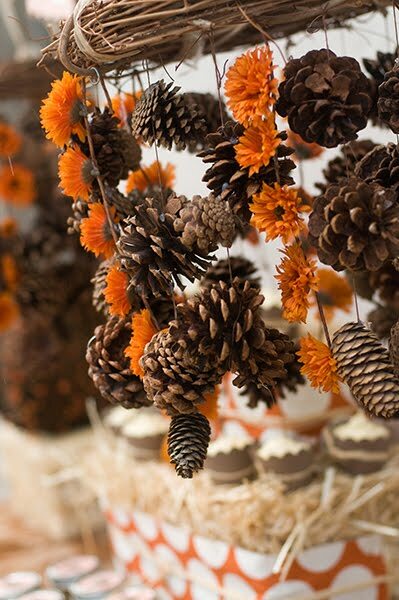 Katie's pine cone chandeliers are so eye-catching! 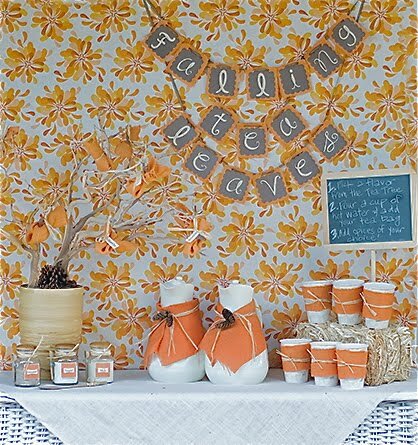 Especially mixed with the large polka dot and orange fabric. 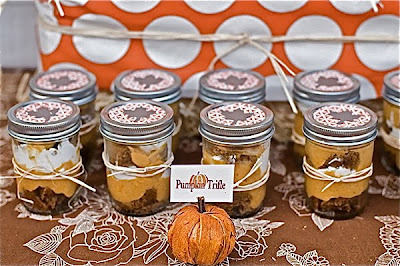 Katie serves individual mason jars of pumpkin trifle for each guest -- such a personalized touch with the fall leaf label and the pumpkin buffet card holder she found at TJ Maxx. 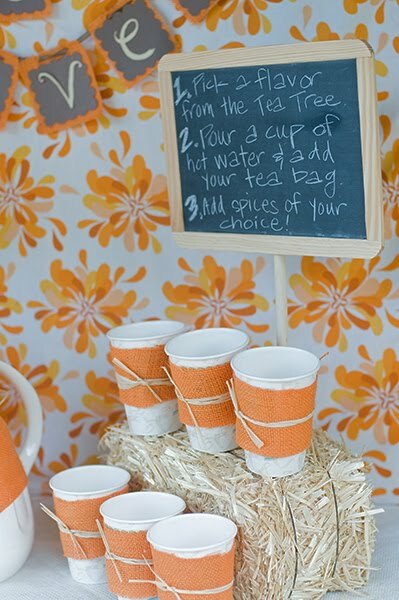 I can't tell you how much I love this idea!! Like I said, Katie is brilliant when it comes to thinking out of the box and using ordinary items to make a statement. She has a wonderful how-to tutorial on her blog if you would like to make your own pine cone chandelier. Again, the individual servings are fun and beautiful, too. These pumpkin pies add to the rustic charm of the entire tablescape. 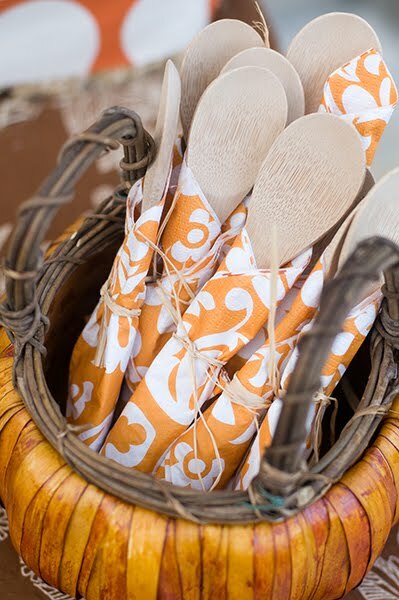 She leaves no detail forgotten, even the spoons are adorned with fabric and raffia. Simple hay wrapped in fabric and raffia -- simply beautiful. pitchers of water were decorated in theme.... love the chalkboard how-to. 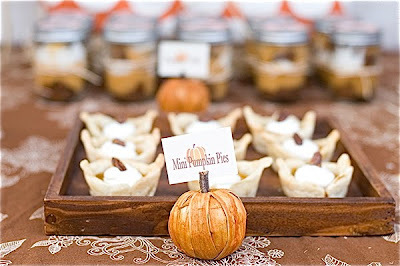 Please go to Katie's blog to see even more amazing photos of her rustic and charming fall tablescape. Congratulate her, too! She won The City Cradle Fall Tablescape Design Challenge -- Hooray, Katie! !